I had so much fun interviewing my girls for these layouts and making them pose for the pictures LOL I have printed the photos onto Glossy A4 paper and then fussy cut them both out. 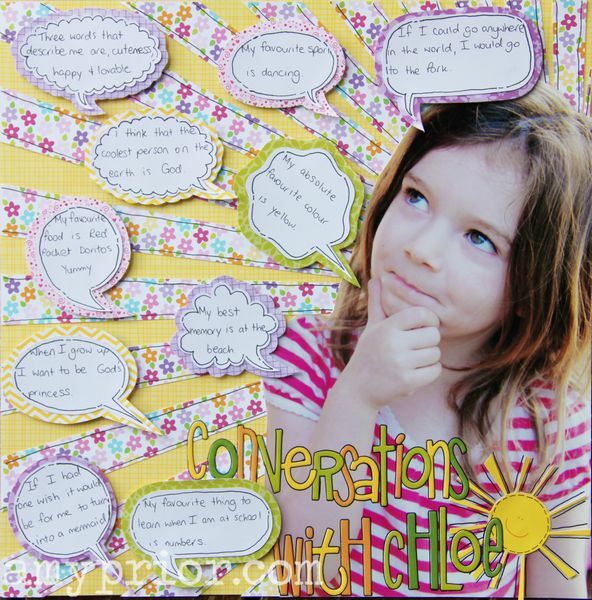 The papers, stickers and fussy cut sun shape were all from Bella Boulevard various collections and I have used my Silhouette Cameo and white cardstock to cut the Speech Bubbles out before mounting onto more Bella Boulevard papers. Well like I said, just a quickie from me today, tune in tomorrow for some more fun and inspiration and thanks so much for stopping by! What a clever layout Amy! I love that photo and the awesome speech bubbles are such a great idea.